Jesus didn’t exclude hostile regions of the world when He gave the command: “Go therefore and make disciples of all the nations” (Matthew 28:19). Through the centuries, believers have suffered and died for the sake of sharing the Good News. For more than 20 years, Samaritan’s Purse has been sharing God’s love with children through Operation Christmas Children, reaching more than 113 million boys and girls with the Gospel by distributing gift-filled shoeboxes in Jesus’ Name. Today, your church can help reach millions of precious children who live in spiritually dark nations. Every gift box your congregation prepares can become a guiding light that helps children and their families feel God’s love as they hear the Gospel: “For God so loved the world that He gave His only begotten Son, that whoever believes in Him should not perish but have everlasting life” (John 3:16). Engage your congregation in the powerful Operation Christmas Child initiative to take the Good News to millions of children who are living in spiritual darkness in nations most closed to the Gospel, and in other volatile regions of the world. Bring our interactive exhibit to your church. Experience what it feels like to step into the darkness of a world without Christ—then see how His light can be revealed through shoebox gifts packed by your church family. Spearhead the challenge for your church to prepare at least 5,000 gift boxes for children in restricted nations. Gift boxes that are designated for restricted regions are not typical Operation Christmas Child shoeboxes. These boxes have a distinct design and must be packed according to specific guidelines. We supply the special boxes, along with easy-to-follow instructions for selecting and packing gifts that can be safely transported across dangerous borders and placed into the hands of boys and girls in Jesus’ Name. Complete the registration form below or contact us at lightinthedarkness@samaritan.org. 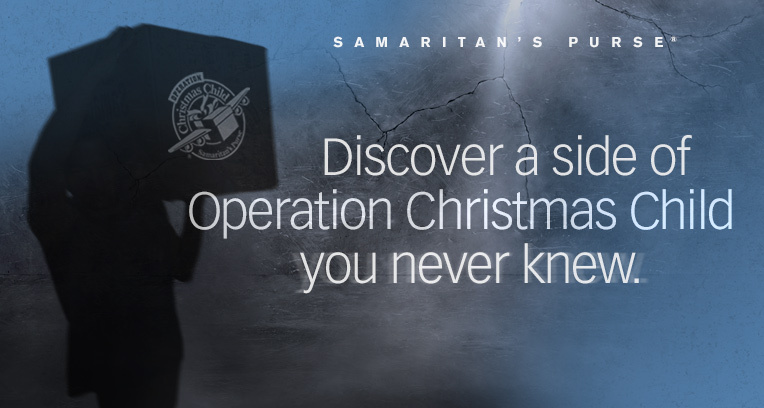 You can also learn more about Operation Christmas Child at samaritanspurse.org/occ. Use these resources to impact your congregation with the vision for sharing the Gospel with children in spiritually dark and restricted nations through Operation Christmas Child.